This card is my entry for the Truly Scrumptious sketch challenge and the Daisy & Dandelion challenge blog. The Truly Scrumptious challenge was to follow the sketch (below) and also to add something shiny to the card. I've added shiny brads, gems and a Papermania metal tag around my cute little bird sentiment!! The challenge on the Daisy & Dandelion blog was to make a card for a friend, so I thought the 'with love' sentiment would be good!! Daisy and little bird stamps from the Daisy & Dandelion clear stamp set, stamped in black ink, clear embossed and coloured with whispers brushmarkers. Printed papers from the Daisy & Dandelion Picnic Patch collection. Flowers punched with medium & small xcut punch. Adhesive gems, brads & metal tag - all Papermania. Well, this is another 3in1 challenge card (trying to save a bit of time while I have visitors!!!). The design of this card is for Loretta's sketch challenge over on DoCrafts. The theme is Easter for the Spoon Full of Sugar challenge and I have used lots of glitter glue for the G is for Glitter challenge on the ABC challenge site!! The stamps I've used were part of a 3pack I bought from MadAboutCards - not sure of the brand! Stamped with black Stazon and coloured with Whispers brushmarkers. Well, I'm cutting it very fine with this one!! This is my entry for the Stampin' Chic sketch challenge no.2, and also for Clare Curd's weekly challenge on the DoCrafts website. The stamp is from CCSR new 'for him' range. I stamped it three times, on white card and two patterned papers, embossed and then cut out and pieced it together. I didn't like the colour of the trousers in the end so went over them with a brown brush marker. Faux stitching added by piercing holes with a pokey tool and then a brown brush marker again. 'Best Wishes' stamp also from CCSR. First of all I'd like to say a big 'Thank You' to everyone who has been visiting my blog and leaving me lovely comments!! It's much appreciated so thank you very much!!! The card I have today is the one I made for my mother-in-law for Mother's Day. It is my challege card for the Sugar Bowl challenge site. The challenge was to make a Mother's Day project using one of the Sugar Nellie stamps. The stamp I used was Daisy (yes, again!!) watercoloured with brushmarkers. I pricked the egdes and added faux stitching. Patterned papers from CCSR Big One paper pack and a DoCrafts goody bag. Tiny buttons - Bought online recently, can't remember where from, will try and find out!! Edges inked with ColourBox fluid chalk. Just a quick one tonight as my Mum is coming to visit tomorrow and I need to clean the house!!! I've got a lot of visitors over the next few weeks so may not be able to make as many cards as usual - but I will try really hard to keep looking at everyone's blogs!!! This is a record for me - 3 challenges in 1 card!! I have to admit this was quite an easy one. The ABC challenge was to use flowers and the challenges on Daring Cardmakers and Clare Curd's DoCraft challenge were both to do something girlie!! 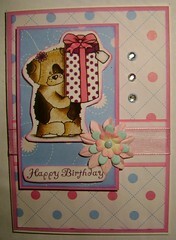 I've used my favourite Daisy stamp from Sugar Nellie and my CCSR BigOne paper pack (I love these papers!!!). The stamp is coloured with Whispers brushmarkers. Thanks for looking and I hope to be back soon!! Monday again! Where did the weekend go!! I've been having a turn out and trying to get things listed for sale on ebay. However, I had a huge faff with the camera and ended up deleting all the photos I'd taken. By the time I'd redone them all it was time to pick up my daughter from nursery so I only got one item listed!!! Not my day!! Now it's nearly time to pick up my eldest from school (where did the day go!!!) but I just wanted to share this card with you. The design was for Loretta's Sketch Challenge over on the DoCrafts website. It's also going to be my entry for this weeks Spoon Full of Sugar Challenge - the challenge was to use gems on the card - they're a bit small but they are there, honest!!! My Mum asked me to make a card for a friend's 60th Birthday and this is what I came up with. I had already coloured the Forever Friends image and wanted to use it but then I got cardmakers block!! I think I had nearly every paper pack I own (of which there are lots, obviously!!!) trying to pick a colour scheme I liked. In the end I chose this using some Basic Grey Eva papers and I think it works. I hope my Mum (and her friend) like it!! Adhesive gems - Papermania - there are 4 on there, see if you can spot them all!!! Well, I've been trying all afternoon to get this card uploaded into Blogger and it's not been working properly, so I've given up and I'm doing it via Flickr. I hope this works!!! This is my entry for the Mojo Monday and Papertake Weekly challenges. For Mojo Monday there was a sketch to follow. The Papertake Weekly challenge was to include something edible on the card so I put this yummy cake stand on!!! Thanks for looking and I hope you've all had a great weekend!!! Good morning everyone and a Happy Mother's Day to all the Mum's out there!!! I've been having a lovely morning today. It started with my annual lie-in!!! Actually it was one of those wide-awake and noisy ones, with the girls running round the house and my youngest popping in to see me frequently, swiftly followed by my husband taking her away again......but it's the thought that counts and it was very nice not to have to get out of bed!!!! Then the girls took me into the dining room where they had laid out a lovely breakfast, together with flowers and lots of cards they'd made at nursery, school, rainbows etc. To top it all off, they'd been to my local craft shop (Papercrafts in Elgin, the home of the wonderful Sugar Nellie stamps!!!) and bought me some new stamps. I have three new Sugar Nellies and some Woodware stamps with owls and trees on!!! So I'm a very happy bunny today and can't wait to get using my new stamps! I have a card to post on here later but haven't taken photos yet so I'll be back soon. Hope you all have an enjoyable day!! Friday at last! It's been a busy week but a lovely day today. So lovely in fact that I decided to clean the car!! To be fair it was absolutely revolting!!! What with the children and the dog it does get a bit mucky inside. So I spent most of the afternoon out in the sun which was lovely! I did get a card made this morning though. I have used this weeks sketch challenge from Sketch Saturday. The card is for one of my daughter's friends. She is going to his party at lunch time on Sunday.....so no mother's day outing for us!!! Well, I think that's all for now. I'm off to get the girls to bed!! My husband's gone out for the evening so I'm spoilt for choice - card making or girlie video!!! Maybe I'll do both. Well, I finally got my Mother's Day parcels in the post (I've some projects to put on here after Sunday!!). So now I've done a card for the Stampin' Chic challenge. This week the challenge was limited supplies - specifically to only use one piece of patterened paper! I couldn't decide on which paper to use - so went for patterned acetate instead! I've been meaning to try a card like this for ages. 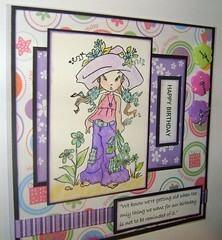 The main embellishment is made from flowers stamped from the CCSR doodle stamps. I've used turquoise and lime green ink (Ink It Up mini pad collection), clear embossed and cut them out. I then coloured them in (in hindsight I should have done this before I cut them out!!!) with a waterbrush and Dovecraft shimmer chalks. I have added another flower inside to carry on the theme. The sentiment is also one of the CCSR stamps. I've put matching panels on the back and front to hide all the dst and brads. Thanks for looking. I hope you like my card!! It all looks lovely so pop on over and have a look!!! I have made cards today - two, for mother's day, so I'm not going to post them on here yet!! I've had a fun day today. My eldest daughter had a school assembly and parents were invited to go and watch. They did a couple of fairy tale sketches and she got to play Cinderella! She is a complete drama queen (you should see the tantrums!!) and absolutely loved this....and as a biased doting parent I thought she was great!!! 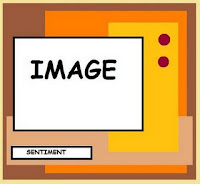 To enter the challenge there is a sketch to follow and also a stamped image must be added. I think the elephant stamp is Prima. I got it in my local craft shop. I've stamped in black stazon and watercoloured with whispers brushmarkers. The patterned papers are from CCSR Big One paper pack. The pink backing paper I think came from a 'fill your own box' selection at Papermill. I had a play with the backing paper - distressed the edges, crumpled it, sanded over the top and then brushed over white fluid chalk. Please let me know what you think of it!! The flowers are stamps from Clare Curd's new range, stamped in black ink, clear embossed, cut out by hand and then the edges curled up a bit. I've also pricked all the edges and drawn stitching in with a black brushmarker to follow the sketch a bit. I hope you like it! Yet again the colours on my photos haven't come out quite right - the card looks a lot more vibrant than this, honest!! Well, it's been a busy day here today and I nearly didn't get a card made, but thought I really must put the effort in when it's only week 1 of my blog!! I had some very exciting news this morning when I looked on Clare Curd's website on DoCrafts and found out I had won her sketch challenge!! This was for the Daisy & Dandelion sketch card that I posted on here on Friday. I'm really please as I've never won anything for any of my cards before!!! Today we went geocaching. It's a sort of treasure hunting game with a gps, a bit like the old letterboxing but you have a box to find with little toys to swap. My girls love it and it's the best way we've found to get them out walking our dog without too much fuss!! Today we went for a walk along Lossiemouth beach with some friends. Lovely day but the cache was a bit further away than we were expecting (about a 3 mile round trip across sand dunes!!). Very tiring and my youngest daughter struggled a bit on the way back -lured on by the promise of the ice cream shop!! Still, the good thing was they went to sleep with no bother at all so I could go and make this card!!! This is for Loretta's sketch challenge on the DoCrafts website. Hope you like it! The stamp is from one of the Papermania snag 'em duos, stamped with black stazon and coloured with whispers brushmarkers. Papers (including the sentiment) from the new CCSR Big One paper pack. Edges chalked with fluid chalk - Colourbox in Charcol and Versamagic in Cloud White. Good morning everyone! I just wanted to say a big thank you to all of you who have started following my blog!! It's lovely to have you here - hopefully you'll stay!! I've been colouring in some images this morning so hopefully I'll get a new card on later!! Well, it's been a busy day today what with ballet lessons etc (my daughters' not mine!! ), so I haven't got any cards made. Tonight we've got a babysitter and we're going out to dinner with some friends. Haven't done that for ages so I'm really looking forward to it!! We're going to a local restaurant in a converted church that serves tapas - sounds interesting!! So, I'm cheating today and posting a card I made last week!!!! This card was for one of Clare Curd's challenges over on DoCrafts. The challenge was to incorporate a quote in your card and I have to admit I struggled with this. I'm not one for putting loads of words on cards, Usually 'Happy Birthday' is about as far as I'll get!! "We know we're getting older when the only thing we want for our Birthday is not to be reminded of it"!! I thought that was quite a good quote. I'm starting to feel like that!!! Sugar Nellie stamp - Sweet 'n Sassy - isn't she just gorgeous!! Buttons - I think they were from a kids craft pack I bought from the Early Learning Centre!! Just goes to show you can get craft supplies anywhere!!! Well, I hope you like my card. I'm off to give the girls a quick tea and get ready for my night out!!! This is my second card for today, again following Clare Curd's sketch challenge. 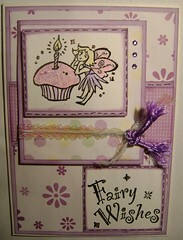 The fairy stamps are from the new Papermania Snag 'em stamp duos. Stamped in black ink and clear embossed. I've coloured them with brush markers and then highlighted with Diamond Stickles glitter glue. I've added some faux stitching with a fine black pen. Lilac card - local craft shop. The ribbon tied underneath the fairy is actually a pretty holographic white colour but seems to be showing up yellow on the photo!!! Hope you like the cards!! A couple of quick cards to share with you today. These were made for Clare Curd's sketch challenge over on DoCrafts. My daughters have a few of their friends birthdays coming up so I made some cards for them. The first is using the new Daisy & Dandelion range at DoCrafts. I bought the recent goody bag and they had loads of cute stickers in so I thought I'd make a girly card with them. I haven't used stickers in ages (got loads, as well as the dreaded peel offs!!!). I put the stickers on card, cut out and inked all the edges with Colourbox fluid chalk in Orchid Pastel. Backing papers - DoCrafts Picnic Patch collection. Paper flowers - a mixture from MadABoutCards, Lakeland and local craft shop!! Well, I havent' got a card for you this morning but couldn't resist sharing this photo with you. It's of my gorgeous (yes, I'm biased!) youngest daughter off to nursery for red nose day. They were told to go with crazy hair. I think this fits the bill!!! I'm dreading getting this out of her hair later!!!! 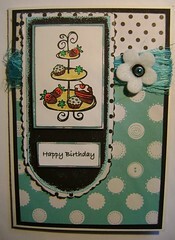 This is my entry for the Stampin Chic and Truly Scrumptious Challenges. The sketch layout is from Truly Scrumptious. The challenge was also to include handmade buttons. I have done these using the new Clare Curd Signature Range stamps which have been clear embossed and cut out. 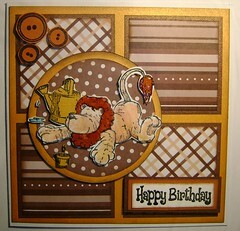 The Stampin Chic challenge was to do paper piecing on a card which included some CCSR products. My main image is the lion Rory from Sugar Nellie. I have paper pieced his mane, tail, the watering can and the plant pot using a mixture of Core-dinations card and card from my local craft shop. I tried to cover the mane and tail with clear embossing powder but it didn't work very well so I added Anita's Clear Glaze instead!! The background papers and Happy Birthday stamp are all from the new CCSR. I love the greetings stamps - so many to choose from - and as for the Big One paper pack, I'll be using it for ages!!! Yipee!! I think it's working now!! I've also been trying to work out how to add a link to my email address. If anyone knows how to do it please could you let me know!!! It's clairewright73@googlemail.com. I've been mucking about with the comment feature in the settings so it should now take comments, but I've been told it still isn't working which is really annoying!! If anyone knows how I can sort it out I'd appreciate some advice! I've got my first Truly Scruptious and CCSR challenge card finished today. Just need to take some photos and get it uploaded, but I'm putting it off a bit as it's for my brother's birthday and I am worried he'll see it (although it needs to be on here by tomorrow for CCSR so I think I'll just have to take my chances!!!). Been a lovely day here in Scotland - no rain for a change - but very windy! Off to make the girls tea now. I'll be back later to add my card on!! Sugar Nellie Christmas card challenge, originally uploaded by claire wright. This is my entry for The Sugar BowlChristmas card challenge. I can't believe I've made a Christmas card already. Last year I didn't start until November!! (and then it was a bit of a rush to be honest). 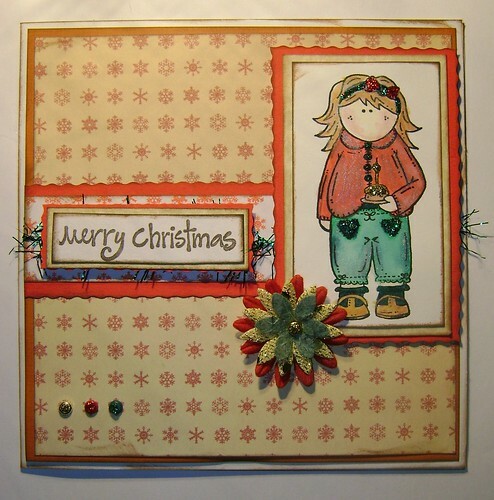 The challenge was to make a card with a Sugar Nellie stamp. I don't have any Christmassy Sugar Nellie's (yet!) so used this image of Nellie with a cake and tried to make the colours look Chrismassy. Unfortunately when I took a photo it's come out all orange looking instead of red. Oops!! Nellie coloured in with Whispers brushmarkers and twinkling h2o's. Backing papers a free download from madaboutcards. Thanks for looking. Any comments welcome!!! Well, it's taken most of the afternoon/evening but I've finally got my blog up and running (I think!!). I had all sorts of trouble trying to get my template to work and ended up deleting the whole blog and starting again!!! Now I have to try and add some cards on and remember to keep posting on here. Comments welcome!!! !